The New York Knicks' 'Linderella': American-Born Jeremy Lin Is The Pride Of China Basketball fans in China are rooting for Jeremy Lin, the New York Knicks' star point guard, as one of their own. But Lin, whose parents are originally from Taiwan, was born and bred in the U.S. — unlike the Chinese NBA star Yao Ming, with whom he is often compared. New York Knicks star Jeremy Lin (shown here during first-half action against the Toronto Raptors on Tuesday) has taken the NBA by storm. Now, Chinese basketball fans are claiming the California native as their own. How do you say "Linsanity" in Chinese? Lin Shuhao feng. And how do you quantify it? Jeremy Lin has more than a million followers so far on the Chinese version of Twitter. The legend of Lin, the Asian-American point guard for the New York Knicks whose success story draws comparisons to a fairy tale, continues to grow. 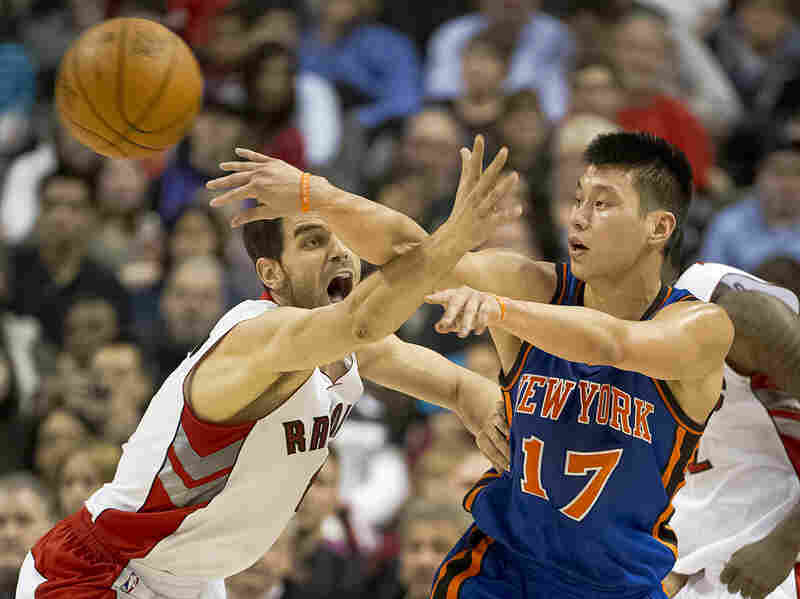 On Tuesday night, he scored 27 points, including the winning shot, in the Knicks' victory over the Toronto Raptors. Lin has been a sensation in the U.S., but he has also become a point of pride in China. Although Lin was born in America, many Chinese basketball fans are now claiming him as their own. At a gym in Shanghai this week, basketball players say they've been awed by Lin's performance in the past week and a half. Wang Qi plays at the court regularly. He says that when Lin scored 38 points against Kobe Bryant and the Los Angeles Lakers last Friday, he became a believer. "I never imagined he could score so many points in a game against the Lakers," says Wang, who works for a local university. "He is China's pride." It's a cold, rainy night at the court, a four-story walk-up with graffiti-scrawled walls and open windows. Wang is playing half-court in a burgundy sweater and jeans. During a break between games, Wang says he doesn't see Lin as American. "What country is he from? He's Chinese," Wang says. "His ancestry is Chinese." Actually, Lin grew up in California and attended Harvard. Even Lin's parents aren't from mainland China, but from the island of Taiwan, a de facto independent country that China claims as its own. But Wang won't budge on his adopted basketball star. "Although he was born in the U.S., he doesn't represent America," Wang says. "He represents the Chinese. His skin is the skin of the yellow people." The reference to skin color is offensive in English, but Chinese say it in Mandarin all the time. Yang Yi, deputy chief editor of China's most popular sports newspaper, Titan Sports, says his sports blog is loaded with comments from basketball fans who see themselves in Lin. "They only see Lin's face, a Chinese face, and Lin Shuhao, a Chinese name, so they use this very Chinese way of thinking," Yang says. "They think: 'Why can't Lin play for the Chinese national basketball team? If he could play for China, how great would that be?' "
Not everyone in China is consumed by the Knicks' new star. Back at the Shanghai basketball court, Li Mengyun is shooting baskets with his left hand while talking on a cellphone with his right. When asked about Jeremy Lin, Wang replies, "I've heard of him, but I'm not very clear. Ever since Yao Ming retired, I haven't been paying as much attention to the NBA." Yao Ming is a huge star in China, as well as the country's most successful NBA player. He retired last summer from the Houston Rockets after a series of injuries. China's millions of hard-core basketball fans were heartbroken. Li, who sells iPhones for a living, says Yao is irreplaceable. "Yao is very, very famous, you know. I think no Chinese player can play as well as him," Li says. But Yang, the sports editor, says Lin could have more appeal over time. Until now, Chinese players in the NBA have been 7-foot-plus centers like Yao and Wang Zhizhi, who played for the Dallas Mavericks and the Miami Heat. Lin is a 6-foot-3-inch, 200-pound guard — much easier for most Chinese players to relate to. "Yao Ming and Wang Zhizhi were excellent players, but fans can hardly learn their styles, because without Yao's stature, you can't learn his way of playing," says Yang. "But Lin is someone everybody can imitate." Yang says Jeremy Lin has tremendous marketing potential in China. The NBA is working to add Knicks games to Chinese TV and websites. And Lin's No. 17 jersey has already sold out on China's e-commerce giant, Taobao.